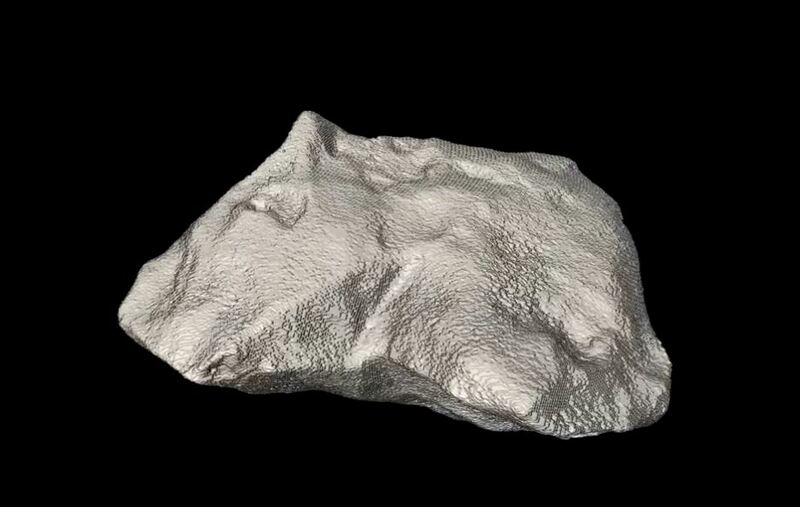 What happened next to this year’s most famous meteorite? Lots! Well first, it was the star attraction on campus and the celebrity for many #selfies. Then, in the week that followed it’s media debut, apparent controversy emerged as to who owns the meteorite? Well, it’s not controversial at all, as Dr Gretchen Benedix explains here. Next, we needed to know, what’s inside the meteorite? Our friends and collaborators at CSIRO (the Commonwealth Scientific and Industrial Research Organisation) in Perth scanned the meteorite using a CT scanner, similar to what’s at most hospitals. Dr. Lionel Esteban (from CSIRO Energy group) scanned the meteorite using the medical X-ray CT scanner from the National Geosequestration Laboratory*. The data were processed by Dr. Belinda Godel (from another CSIRO group , the Mineral Resources team) using workflows developed for ore materials at the Advanced Resource Characterisation Facility. Once our experts had a look at the CT scan, they were able to share this with another collaborator, David Vaughan, a specialist geologist who has a super precise diamond wire saw. It was important to use the very best of saws to minimise the amount of waste. When you cut into a rock, you will always lose some crumbs, just like trying to cut a cookie in half. Many people will be sad to hear that the headline-making, love-heart shaped meteorite is now in pieces, but each piece can tell us so much more about the meteorite and further our understanding of our solar system. Now that we have some samples to analyse, our experts will get on to describing it, much like if scientists found a new bacteria or made a new chemical compound. This will then be sent off as an official submission to the international Meteoritical Society who ensure that the rock has been identified correctly. We’re hoping they will agree on a name for the rock that will be submitted by the Arabana people. Once it’s officially registered, we can get onto understanding the make-up of the rock and what that means about our early solar system. The National Geosequestration Laboratory (NGL) is a collaboration between CSIRO, The University of Western Australia and Curtin University established to conduct and deploy critical research and development to enable commercial-scale carbon storage options.